John James Audubon named this small, drab vireo for his friend and companion John Bell. A shy, secretive bird, Bell’s Vireo, is more often heard than seen as it forges dense underbrush for insects and spiders. There is little difference in the plumage of males and females although color does vary slightly across its range. Bell’s Vireo has been in large decline over the last 40 years due to habitat loss and brood parasitism by Brown-headed Cowbirds. Description: Drab gray to green on back, white to yellowish underparts, breast unstreaked, two pale wing bars, short, straight, blunt tipped, stout bill, flicks and pumps it’s relatively long tail. Voice: An unmusical, harsh, scolding, scratchy 2 phrase song – “Cheedle, cheedle chew, cheedle, cheedle, chew”. Juvenile White-eyed Vireo – grayish olive underparts, wash of yellow on sides and flanks, two white wing bars, bright yellow eye spectacles. Habitat: Dense, low vegetation, bushy fields, mesquite brush land and young undergrowth in woodlands and forests usually near water. Nesting and reproduction: Rarely documented. Fledging – 10-12 days but remain with adults 25-30 days more. Nest – Open, deep, rounded bag-like cup bound to twigs by the rim, made of barks strips, grass, leaf fragments, feathers bound together with spider web and cocoons. 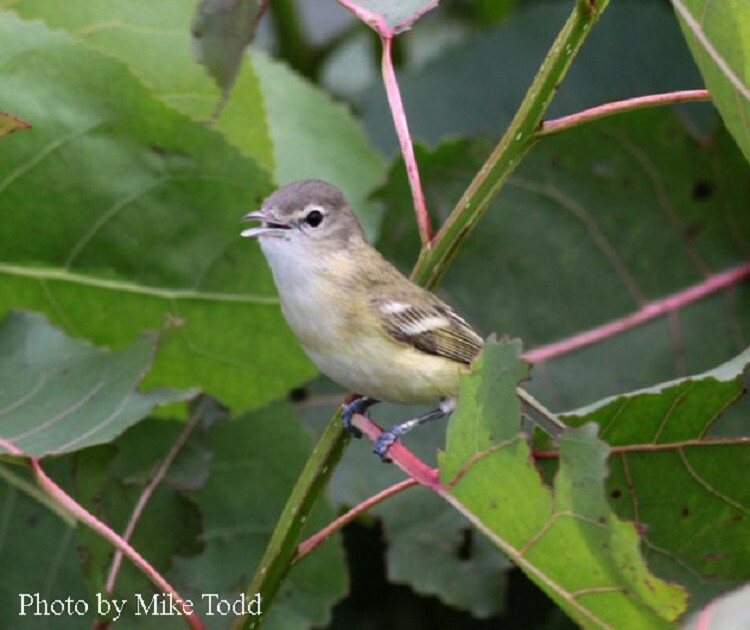 Status in Tennessee: Bell’s Vireo is a rare neotropical migrant in early spring and summer in Tennessee. The Bell’s Vireo has not been documented drinking water. It may get all it needs from the insects it eats. There are currently 4 subspecies of Bell’s Vireo. Best places to see in Tennessee: Black Bayou at Reelfoot Lake, Ensley Bottoms, and Fort Campbell Army Base.